Sudden transitions and grand variations in the solar dynamo, past and future. I’m not sure if other bloggers have written about this. If so, here it is again. The paper forecasts solar activity for the current Solar cycle 24, which they expect will peak in May, 2013 with a maximum sunspot number Rmax of 62 ± 12. 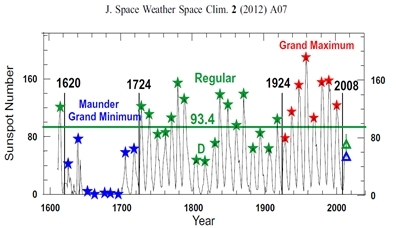 That of course is good news, as the world can ill-afford climate conditions like the ones we saw during the Maunder Minimum – especially with governments racing to prepare for the exact opposite.